Frustration and longing trouble Anna Mae Phipps. When her husband leaves for a Works Progress Administration job, she fears he'll abandon the family like so many other men. An argument prior to his departure adds to her concerns. Harley Phipps loves his wife and children. He'll do anything to save their farm and provide for them. When he hears about the government job, he jumps at the opportunity even though it means leaving home for a period of time. Misunderstandings pile up as distance and hardship tighten their stranglehold. Will the couple be able to handle the strain on their marriage or will love die in the fires of adversity? Kim Vogel Sawyer brings us a Depression-era story filled with courage and hope. My grandparents often shared about those difficult times. The comparison between those who give up and those who become stronger piques my interest. Why do some get consumed by their circumstances, while others press on and triumph? I think Kim gets to the core of their strength. Well-written, tugging-at-your-heartstrings characters, and realistic setting make this book a must read for historical fiction lovers. If you've never read her novels, this is a good place to start. As a sidelight, it's interesting to see historicals being written about the 20th century. As I said to a friend, "they're getting closer to my generation every day." One no longer has to dive into the 17th and 18th centuries to produce a historical. The early 20th century is fast becoming a popular timeframe. What do you think about writing a historical set in the 20th century? Is it something you'd consider? Well, my historical is set in 1918, which I think is interesting because it's such a mix of future and past. Carriages beside cars, telephones and telegraphs. Sounds like an interesting story. Thanks for sharing! Yep, I would consider it and have done it (kinda) in The Rhythm of Secrets, which will be out in January. Thanks for spotlighting Kim, a great writer! Wow! I'm surprised at how popular the 20th Century is becoming for historicals. Susan, you're so good to share all these books and reviews. Thank you! I love reading Depression-era stories. My WIP is set during 1930, so I'd love to read this and see how she did it. I've always thought of historicals in terms of the 1800's and earlier. I must re-think my definition of "historical." I'm thrilled to see historicals being written about this period. There was a time when no one would touch them. One of my critique partners is writing a novel that takes place during the onset of the depression. It's a poignant part of our history. Thanks for your review. Hope you are well, Susan. God be with you this week. I've been thinking about for some reason. My prayers are for you. I'm glad to see 20th century historicals. I might attempt one myself down the road. I posed the question for that very reason: it's partially my century too. It's hard to think of times you lived through as "historical." LOL! I really enjoyed this book too. Yes, I would write about the 20th century, particularly the early part. This sounds like a wonderful story. Reminds me a bit of Sarah Plain and Tall, one of my favorites. History is relative, I suppose. My husband was shocked when the jr. high class he taught in 1989 had never heard of Watergate! I think folks have a yearing for the past. Nostalgia is always popular in stressful times, even if the time written about is stressful (say World War I or Depression). For me, I most prefer historicals set at least a century ago, but I've read a few in later times that I've enjoyed, nothing past 1920's though. Thanks. Oh, I also like Sarah Plain and Tall. LOL! I know how your husband felt. I remember a big nostalgia craze for dolls and other collectibles from the 50's and 60's. Perhaps, it's a way of preserving our memories. Sounds like a great book! Thanks for the review. Have a blessed weekend! I've just added this novel to my reading list. It sounds just like something I'd love to read. I never even thought about the fact that historical now includes 20th century. Great point! 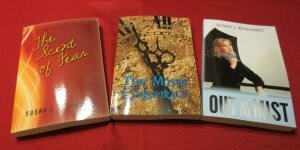 I love reading historical fiction, but I doubt I could write it well. Who knows, maybe some day I'll give it a try! Thanks so much for stopping by my blog. I love the way you guys linked through followers. I'll visit some of your followers and try the same thing! I wish you a wonderful Saturday. 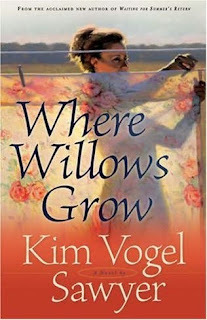 I recently finished reading one of Kim Vogel Sawyer's books. She does a marvelous job making the time of the story come alive. I agree. I like the way it's so natural. The setting and timeframe are there without a trumpet blowing to call attention to the details. Thanks for visiting my blog. I came here to check out yours and I'm glad I did because that book sounds like one I'd love! Farms and depression era are favorite settings for me but hard to find. The Grapes of Wrath is one of my all time favorite books. Welcome to my blog! I'm glad you found something special here. Kim Vogel Sawyer did a great job on this book. I know you'll like it. I'll be doing an interview with her soon (one of my Wednesday posts). I hope you'll check it out. This sounds like an interesting story - I just may need to check this one out! Thanks for the review.